Visitor Information at Beaverhill Lake Nature Centre/Museum facility (on service road) 5020 - 48 Ave. Open Mid-June through Labour Day. 780-662-3191 or 780-662-3269. 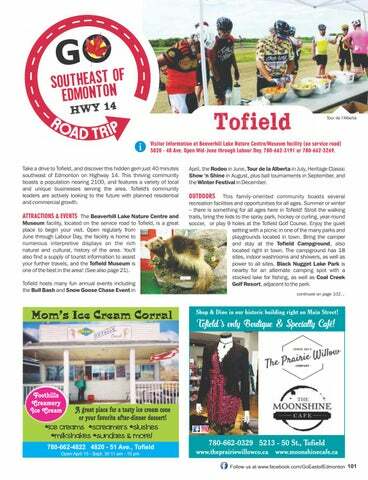 Take a drive to Tofield, and discover this hidden gem just 40 minutes southeast of Edmonton on Highway 14. This thriving community boasts a population nearing 2100, and features a variety of local and unique businesses serving the area. Tofield's community leaders are actively looking to the future with planned residential and commercial growth. April, the Rodeo in June, Tour de la Alberta in July, Heritage Classic Show ‘n Shine in August, plus ball tournaments in September, and the Winter Festival in December. Shop & Dine in our historic building right on Main Street! Toﬁeld’s only Boutique & Specialty Café! A great place for a tasty ice cream cone or your favorite after-dinner dessert!